"Every product tells us a story." This was proclaimed by Carlo Ratti, Director of the MIT Senseable City Lab, at the World Expo in Milan which was devoted to food and technological environments. His Future Food District introduces technology at all stages of the food chain. The connected supermarket opens the door to a new era, in which products will begin to speak. This is connected commerce and its myriad new services. Here's a quick look at five technologies to keep an eye on. ShelfZone is an experiment started in 2015 by Imille, a Milan-based communications company. This virtual reality simulator was designed to assess consumers' behaviours in the aisles of supermarkets depending on product placement. ShelfZone is a headset that allows shoppers to move through the virtual supermarket, select products and see their packaging. An eye-tracking system monitors the position of the eyes—a valuable tool in studying customer behaviour in mass retail. 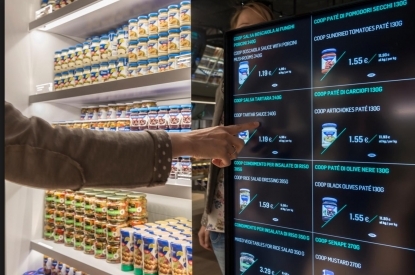 Also in 2015, Carlo Ratti and the Italian supermarket chain Coop served up their own version of the supermarket of the future. Here, there is neither music nor advertising. Customers move through a quiet space designed to reconnect consumers with producers. "Today, when people enter a supermarket, they try to get out as quickly as possible," observes Carlo Ratti. For him, the future lies in modestly-sized spaces that are fully interactive and meet people's needs. When a shopper points to a product, information appears automatically on screens: origin, nutritional value, environmental footprint, etc. Accenture is leveraging Microsoft's Kinect technology to produce this movement-based service. There is no server—only screens that display content ranging from price to nutrition information. Buying intentions are compared with actual purchases in total transparency. These megadata are managed by Sitecore, along with custom analysis solutions. More than 100 m2 of megadata walls surround the supermarket and display customer information in real time. The screens also show the most popular products and the latest purchases, the idea being, of course, to introduce customers to new products. When consumers download the app, their buying behaviour and food allergies will guide them to suitable products by finding them in the store. Even robotics are in on the act, with the arms of the Umi robot taking and packaging apples in the aisles. This revolutionary concept is the result of three years of work and a 15-million-euro budget. Carrefour chose Euralille to try out its new promotional concept for points of sale. The idea is simple: a tablet is attached to the trolley to assist the consumer throughout their shopping. Promotions are pushed and users are guided through their selections. While the concept may seem intrusive, it does have certain advantages. The customer does not miss any discounts. As their trolley approaches a product on special, the tablet tells the consumer exactly where the deal is. The program at work in this tablet is Promo C, an app developed two years ago that makes it possible to add a product to one's shopping list just by scanning the bar code. Self-scan: Waitrose launches "Scan as you shop"
matters to consumers. Speed, flexibility...Waitrose hopes to encourage them to make their purchases more easily. But is that the only reason? "Scan as you shop" is, of course, connected to the chain's loyalty programme, Quick Check which was launched in 2015. Customers complete their shopping faster, but they also get access to specials and can manage their spending. The "Scan as you shop" app lets users add Quick Check and access all this information on a smartphone. It is mainly in American culture that shopping malls are gathering places. Unibail-Rodamco was inspired by this model to launch "Meet My Friends", an app for smartphones that allows consumers to set their geo-location and find their friends at the mall in a single click. The concept is based on the premise that customers yearn for an increasingly personalised approach from consumer brands and venues. Mission accomplished with "Meet My Friends", which is totally rethinking the act of shopping. Unibail-Rodamco drew on a 2015 study by its Shopping Observatory in partnership with Ipsos. That study revealed that 62% of the French were always yearning to be surprised when they went into shops and that 60% of them want to see more geo-location offerings in shopping malls. Connected retail: is it really a new frontier? Not quite if one considers, for example, South Korea, where back in 2011 Home Plus was already banking on virtual supermarkets to optimise retail space. For example, display windows in the subway system enable users to choose their products directly by scanning QR codes. Talk about optimising one's commute! Meanwhile, the study "Retail 4.0: The future of retail grocery in a digital world" from McKinsey & Company reminds readers that the future of retail will above all be physical trade. Everything comes down to the art and the means of inventing new points of contact between the hyper-connected consumer and the world of e-commerce. 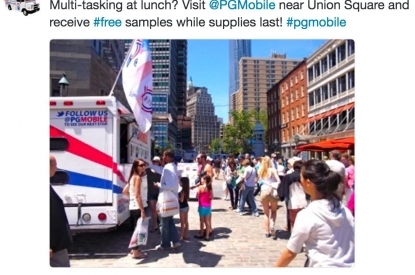 Such is the case, for example, of P&G Walmart which launched the @PGMobile food truck in 2012 that allowed New Yorkers to scan their products' QR codes to make their shopping faster. Link to the tweet directly: HERE. Clearly, in supermarkets' aisles and beyond their walls, data that enable greater mobility and personalisation will revolutionise commerce. The first revolution came 60 years ago with the arrival of superstores. Today, digital tools are appearing at every stage of food distribution. By analysing sourced data, brands and chains will be able to take informed decisions, from stock management to marketing strategy to in-store displays. This will empower them to better understand consumer behaviour and to engage them in a more individualised relationship…for a fresh overhaul of the business model by 2020!